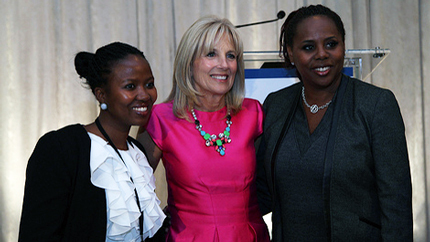 Dr. Jill Biden, second lady of the United States, believes in the power of mentoring and in the power of the TechWomen program. "I love the idea of women helping other women to succeed and to soar,” she said. On November 4, 2013, she joined 174 incredible women from the Middle East, Sub-Saharan Africa, and all around the United States in Washington to hear about their mentoring experience. These women are trailblazing female leaders in science, technology, engineering, and mathematics (STEM) who served as emerging leaders and mentors, and were paired up to work side-by-side for five weeks at companies in Silicon Valley and the San Francisco Bay Area. Women from Algeria, Cameroon, Egypt, Jordan, Kenya, Lebanon, Libya, Morocco, Nigeria, the Palestinian Territories, Rwanda, Sierra Leone, South Africa, Tunisia, Yemen, and Zimbabwe spoke about the new knowledge they gained, networking opportunities they took part in, and most importantly, the relationships they built to support their careers and start-ups back home. The relationships that these women form– both in the United States and throughout the world –inspire ideas and innovation that can solve international issues we all face such as environmental degradation and extreme poverty. TechWomen was designed to increase the trade capacity of the participating countries, promote economic advancement, and support the global commitment of the United States to advance the rights and participation of women and girls in communities around the world by enabling them to reach their full potential in the STEM fields.